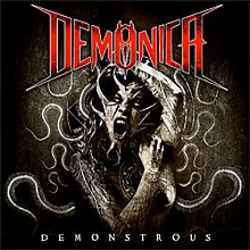 Demonica get the thrash metal heart bouncing with joy. The cover artwork lets you rather expect a black or gothic metal band, but they are playing undiluted old school thrash metal. The line-up explains this orientation, as Demonica is the new band of Mercyful Fate guitarist Hank Sherman, joined by no other than Forbidden guitarist Craig Lociero. The remaining two musicians were active in Defiance and Corruption, only vocalist Klaus Hyr has a blank past. Their debut album Demonstrous starts with the awesome opener Demon Class, making hungry for more. The fast thrash metal from the late Eighties and early Nineties is supplemented with some modern elements to create a very dynamic sound. The rhythm section is doing a swift and precise job, with the guitars taking care of the harmonies. Vocals and instrumentation both made me think of Savatage and Metal Church. The songs are brimming with energy and the musicians don’t hide the fun they had recording them. Demonica often switch between faster and slower parts, with the breaks always working perfectly. Sometimes they flirt with modern metal sounds, as on Luscious Damned. Even dramatic parts have been added, as on Below Zero and Summoned. The album concludes with a complex instrumental where we get everything from progressive over experimental to atmospheric and even ethnic influences, proving once more their incredible versatility. Even though Demonica are a new band, it’s obvious from the start that seasoned artists are at work, but the five guys are definitely not yet ready to retire. If you like steamy power metal and melodic thrash metal, you will have no excuse to get around Demonstrous.